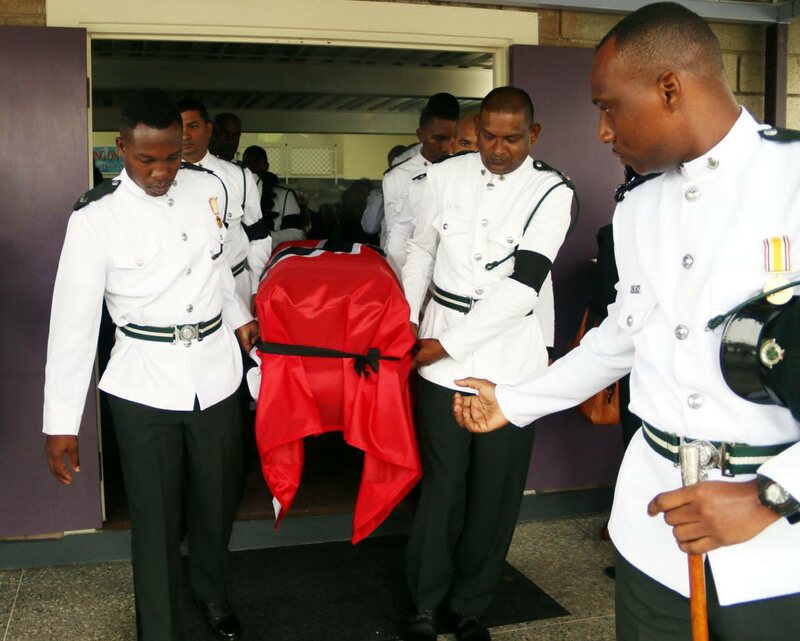 Prisons officers carry the casket of prison officer Darren Francis at his funeral service yesterday. Even as they buried their murdered colleague Darren Francis yesterday, acting Commissioner of Prisons Dane Clarke said more “hits” have been put out on the lives of his officers, including Prison Officers Association president Ceron Richards. Richards, who said after Francis’s killing that threats against officers were the “new normal” in the service, was not at the funeral. Clarke said over the weekend the service had received no less five different calls threatening the lives of other officers, including Richards. He said what was frightening was that the people who are making the calls have the capability to carry out the threats. It was an emotional send-off for Francis, as one of his two sons, Tyrel, broke down as he tried to do a scripture reading. Francis’s brother David also became overwhelmed, but managed to deliver the eulogy, in which he pledged to raise his brother’s sons, Tyrel and Maurice, and as the kind of men he would be proud of. Greetings were also read from inmates who spoke about the positive impact Francis had had on their lives. Speaking from the pulpit of the Mt Elvin Baptist Church, Hindustan, yesterday, overlooking Francis’ casket, draped with the national flag, Clarke told the mourners, “It seems to be the darkest hour with no resolution or recourse in sight. No amount of words can be expressed to ease your exasperation and your weariness. It is a trying time.” He said the threats came even as the men and women in the prison service worked from Thursday to Sunday because of the floods. Reply to "Richards among officers marked for death"